Neptune is the eighth planet from the Sun and the final of the giant ice planets in our solar system. Neptune is named after the Roman god of the sea and is a near twin with Uranus in terms of size and how the atmosphere has been composed. Neptune was the first planet to be discovered not by the naked eye or by randomly searching the night sky; rather it was predicted to exist in a particular position in the sky by mathematical calculations. 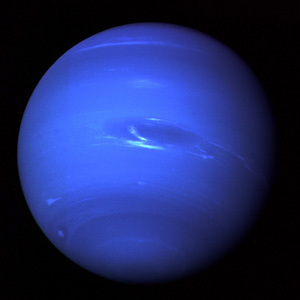 The calculations were sent from French mathematician Urbain Joseph Le Verrier to Johann Gottfried Galle at the Berlin Observatory and in 1846 Neptune was discovered by telescope based on the predicted position. Technically, since it was decided in 2006 by the International Astronomical Union that Pluto should no longer be called a planet anymore, Neptune is now the planet that is furthest away from us in our solar system. Read more amazing facts about Neptune the final giant planet in our solar system. Neptune completes a full orbit around the Sun in 164.8 Earth years, completes a rotation in 16.11 Earth hours and its mass is 17 times heavier than the Earth. On July 12, 2011we will have observed Neptune completing the first orbit since the planet was discovered. Neptune is 4.5 billion km from the Sun. Neptune is the fourth largest planet in the solar system by diameter and the third largest by mass. Neptune has 13 moons that we currently know about. Although it is likely that there are many more moons orbiting Neptune that we simply have not yet discovered. The largest of Neptune’s moons is Triton, which was discovered 17 days after Neptune. It is believed that Neptune was a dwarf planet that was captured by Neptune’s pull. 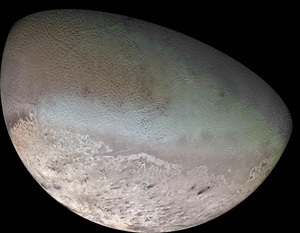 In 1989 Triton was recorded as being the coldest object in the solar system at -235 degrees Celsius. Neptune has very extreme weather and during the 1989 Voyager 2 flyby the Great Dark Spot (similar to the Great Red Spot on Jupiter) was observed. The Great Dark Spot is a storm that is 13,000 km × 6,600 km in size. The weather systems on Neptune are driven by the strongest winds recorded on any planet in our solar system as up to 2,100 km/h. Neptune is a cold planet with temperatures in its outer atmosphere hitting -218 degrees Celsius. 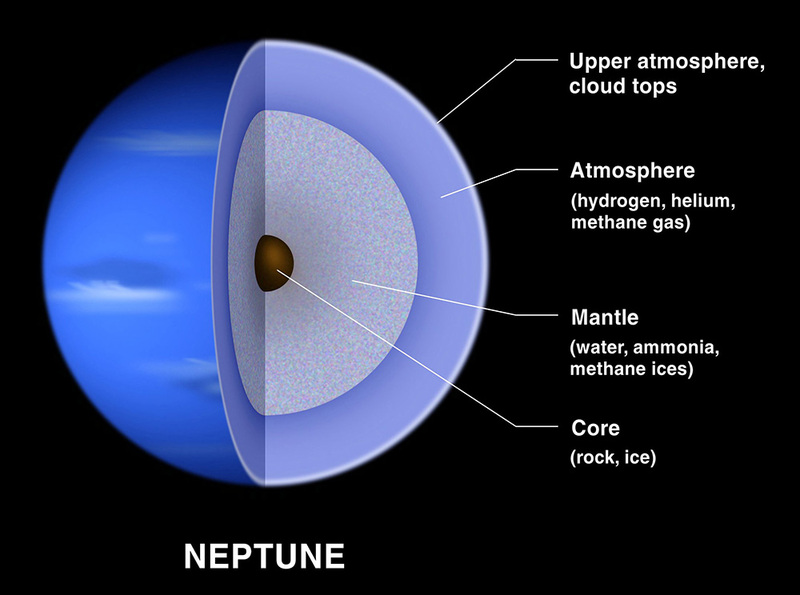 At high altitudes, Neptune’s atmosphere is made up of approximately 80% hydrogen and 19% helium, with trace elements of methane. It is the methane that gives the planet its striking blue colour. Neptune has an outer ring system, although it is much less prominent than Saturn’s rings. There are 3 main rings around Neptune and it is thought that the rings contain ice particles or carbon based materials. Voyager 2 is the only spacecraft to have visited Neptune (in 1989) so there is still much to discover about the planet. Even though Pluto is located further out from the Sun than Neptune, due to the unusual orbital path of Pluto for 20 years out of every 248 Earth years Neptune is the furthest away planet. Neptune is basically a large ball of ice and gas so if you were able to survive the surface conditions (which would not be possible) and attempted to stand on the surface, you would sink.